This article will look at some smart strategies evolving for different types of advertisers to give you an idea of what could work for each one. These aren't the only potential strategies for that client type, but hopefully it'll give you a start for how to apply these to your business. What I want to avoid is telling you what will work. That's akin to telling you what keywords to choose: it'll be different for everybody. High-end retailers rely on finding their demographics. If you're willing to spend $5,000 on a sofa, chances are you're also the right person to spend $800 on a lamp. Use RLSA to bid much more aggressively for existing customers. If they're searching again for a different item you carry, you absolutely want to be present and you can expect a better conversion rate than from everybody else. Subscription services are unlikely to sell a subscription twice. It can happen, but in reality conversion rates for those users will be much lower, even if they're searching again. I have Lovefilm and Netflix subscriptions. After I found Lovefilm, I kept searching in the same market for the second, but I wasn't going to get a second Lovefilm subscription. RLSA here takes the opposite form: reduce bids for people who have already subscribed. They (probably) don't need it again. There's no need to spend money on search again. You can save that budget and use much more targeted emails instead. A low-margin retailer probably can't afford to spend much per click or bid on expensive head terms. These guys are likely to be competing against Amazon, eBay, major supermarkets, etc. Once a user has visited the site however, a whole new world opens up. That's a user who recognizes your brand now. Somebody saw something compelling enough in your messaging before to click your ad or otherwise visit your site. Take advantage! Create a new campaign with all the keywords you can't normally afford. There is traffic there. Lots! It's super exciting if you can get it, and now you can limit yourself to just the subset of users who have engaged with you before. More affordable, better conversion rates. Great! Create a new campaign with competitor names as keywords, and bid on it only for users who have visited your site recently. Make sure you don't drop off their shortlist while they're comparison shopping! You can't tell the user you know them: There are some very real privacy and policy issues at play. If you know that user A just bought a sofa, you can't use your ads to say "Buy this side table, it goes great with your new sofa!" You can (and sometimes should) adjust your ad texts to be more compelling based on what you know about the user, but expect your ads to get disapproved if you start verging close to the line. Don't tell them what you know. You can't remarket to people from a year previously: There is a limit of 180 days on these lists. That's a shame. A compelling case for remarketing on display is for services that renew once per year, like insurance. That's out of play for search, you simply can't hold people in your lists that long. Sorry. You can't use them with Product Listing Ads: This is annoying. Several good use cases for RLSAs involve ecommerce websites. But the best ecommerce ad format is incompatible. I have no idea if we can expect this to change soon, but it seems an obvious connection to make. Keep your eyes peeled. You can't see the stats separately: You can't segment search queries (or quite a lot of other helpful data, frankly) by audience. This is a problem because a negative keyword for one might not be appropriate for the other. This is an argument to keep your RLSA targeted ads in a separate campaign, so that you'll get entirely separate search query reports for each. Is your company on Instagram yet? If so, it joins the 123 Fortune 500s that have added Instagram to their marketing arsenal. Brands like Nike, Starbucks, Ralph Lauren, Whole Foods and more are all top players in the Instagram big brand space. TrackMaven, a competitive analysis firm, has released a study that exposes how these Fortune 500s are using Instagram, and gives tips on how you can use Instagram like a boss, too. Having an Instagram account is one thing, but actually using it is another. TrackMaven explored the percentage of active accounts versus inactive accounts of Fortune 500s and found that of the 123 using Instagram, about 22 percent had active accounts. So what performs better for Fortune 500s – photo or video? TrackMaven says that because Instagram's video service is somewhat new, photos still appear to be doing better for brands versus video. When Are the Best Times to Post on Instagram? The study suggests that businesses using Instagram marketing can reap the benefits of content consumption not just during business hours, but in the evenings and on weekends, too. The following graph shows only a slight variance in user interaction on photos during the week. This idea is similar to what John Lee from Webtrends discussed at SES San Francisco earlier this month when approaching B2B social, stating your social community is consuming social content from your business as regular people at all times of the day, not just as professionals. However, video content specifically performed better during off hours, suggesting "users are more likely to engage with videos when not at work, presumably because of the audio component of video," TrackMaven said in its report. Wondering what photo filters get the most attention? Interestingly enough, the untouched uploaded photo, or #nofilter, was the most-used by Fortune 500s, but the photos with the Mayfair filter seemed to perform the best. Turning to Instagram features that more brands should be capitalizing on, said TrackMaven, is the hashtag. According to the study, number of hashtags correlated to the success of the content. "Looking at the interactions (the sum of likes and comments) per 1,000 followers compared to the number of hashtags used, there is a strong correlation to the number of hashtags used and effectiveness up to 5 hashtags which has the highest average at 21.21 interactions per 1000 followers," TrackMaven said in its report. Although released only a few months ago, videos are only slightly less effective versus pictures in the terms of interactions they received while looking at the Fortune 500, which can account for how new they are. On average, a video on Instagram can get up to 24 interactions (sum of comments and likes). First because of the slow adoption rate from the Fortune 500, other brands can lead the way by providing a different variety with pictures and video. Second, at 15 seconds long and the capability to upload videos that weren't taken with the app, brands have the ability to enhance their videos more. Instagram functions as a highly visual platform; but taking it a step further by adding more videos to your account can give you an advantage with your followers. It's often considered a social media faux pas to use more than two hashtags in a tweet; however, on Instagram, that rule can be thrown out the window. The data proves otherwise for bigger brands, showing that four to 11 hashtags can increase up to on average 77 interactions per Instagram post. When you're incorporating hashtags into your Instagram post, try to integrate them seamlessly into your post caption as opposed to jumbling them all at the bottom. Even though most social media sites have an optimal time to post, Instagram users are on the platform interacting at all hours of the day and every day of the week, especially since users are actively on Instagram through their mobile devices. The Fortune 500 are posting the most during business hours; however, the interaction levels don't point out a clear winner for the optimal time to post. People are rarely away from their phones, so posting at different times of the day ensures advantageous mobile strategies for different audience segments. Because there isn't a finite time to post like on other social media outlets, brands can use this to their advantage to find what is right within their audience. Facebook marketing looks easy. But in reality, it's incredibly difficult. Because simply adding fans isn't good enough. And "engaging with your audience" doesn't pay the bills. If you want to make Facebook marketing work for your organization, then somehow, someway, we need to figure out how to increase reach, engagement, amplification, and achieve some goal -- all at the same time. It's possible, but not easy (especially if you have limited time and money). So everything you do -- each daily tactic and update -- needs to work together to produce the best result. And you need to avoid making these 3 costly mistakes. One of the greatest benefits of social media is the ability to engage with people over time. Because many companies only reach their "inner circle" of friends, family and existing customers or clients. There's no reliable, predictable way to grow the "top of the funnel" and get more, new Facebook fans. The problem is that over time, people begin opting out. This is where "subscriber recency" comes into play, because the longer people are on your list or Facebook page, the less attention they'll inevitably provide. So the best way to grow a successful Facebook page is through creating reliable and repeatable campaigns that you can run consistently. Sure friends and family might get you to 100 fans. But how are you going to get to 1,000? Or 10,000? Creating content updates for social media accounts looks easy from the outside. But in reality, there's a tremendous amount of thought and strategy behind every 140 characters. Each Facebook status update needs to grab awareness, improve engagement, or call people to action. It needs to be pre-planned and coordinated in advance with your other campaigns or updates. And it needs to be an extension of your content marketing strategy. The simple reason why no one interacts with your updates? Because no one cares. Consumers don't care about your company. They don't care about your industry. Consumers only care about how you can help them. Take a look at your last 20 updates on Facebook. Are they about your customer's problems and pain points? Or are they about your company and products? Instead of droning on-and-on about things that no one cares about, try getting in their shoes. What do they want to hear about? What makes them tick? 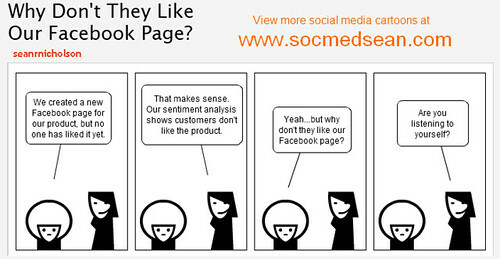 At the end of the day, we're doing Facebook marketing for a reason. We need it to provide more awareness, improve customer service, become a lead, buy something or make a donation. Depending on that main goal or objective, then everything else should fall in place. You should have one or two priorities (max!) for a given time period, and your daily actions should be broken up to achieve those goals. But too often, social media becomes too tactical. We get distracted by Facebook's latest updates. Or we get too busy reacting and responding to customer feedback on our pages (instead of being proactive and furthering our objectives). And many times, there's a big mismatch between what we want and what we can probably achieve. Our expectations are off. For example, almost everyone says they want to drive direct revenue through Facebook. But for most, it's not going to work well. People will never buy over Facebook unless you have great brand awareness, a commoditized product and sales cycle, and a compelling reason to buy now (instead of using another channel at a later date). Otherwise, the best you should hope for is to generate more inbound leads. Your strategy and daily tactics will look completely different too. You'll start promoting more lead-generating content like guides and webinars instead of directly pitching your products and services. You'll spend more time building awareness and nurturing engagement. And your daily interactions will shift from transactional to educational. You want the same goal (revenue! ), but the objective and strategy -- they way you go accomplishing your goal -- will change immensely. Because the quickest way to improve your marketing is to begin with the consumer's point of view. And then adjust your day-to-day tactics around their behaviors and motivations. Remember those creative advocacy campaignswe talked about last week? A couple of them illustrated a dirty little secret to Facebook success: if you want to get your content widely shared, and you have an email list, send out a message asking people to share it. You’re likely to find that the posts you email will far out-perform your normal Facebook content. Sounds like cheating, doesn’t it? After all, the whole point of putting good content out on Facebook is that it boosts engagement (Likes/Shares/Comments), so that Facebook will think you’re popular and show your posts to more people, an effect that carries over to your future activity. But words and pictures alone aren’t enough — Facebook only displays a given post to a small percentage of your fans by default, and many of them won’t even be online in the brief window when your content is high in someone’s feed. As a result, most of your hard-earned fans won’t even know it when you’ve put out something great. Unless, of course, you reach out directly to them. Actually, using email to drive Facebook activity is a classic example of campaign integration — using tools to reinforce each other. In this case, Facebook’s strength is that your supporters’ engagement with your content is visible to their friends, since their Likes/Shares/Comments will show up in their own feeds. Hence, your CONTENT is visible to their friends, giving you opportunities to spread your messaging and recruit new followers. Email’s strength, by contrast, is its relatively high response rate — if you have an active list, your members are much more likely to act on an email than they are to even have a chance to see your content on Facebook. Of course, you’ll need to make the action as easy as possible, particularly by including links that allow people to promote your content simply by clicking on them. So, by emailing a “Share ask,” you leverage your email support to boost your Facebook visibility. And in the process, you give your activists something practical and useful to do that doesn’t involve emailing Congress for the umpteenth time. Also note: your list isn’t the only email tool that’s valuable for Facebook support, since a good coalition/issue listserv post can encourage your allies to help out, too. BTW, here’s a quick trick to spotting when someone’s promoted a post via email: look at the ratio of the post’s Likes, Shares and Comments. On a normal post, we’ll usually see more Likes than Comments and more Comments than Shares, and usually the numbers will be fairly close to each other. In an email-promoted post, by contrast, one of those numbers will go through the roof compared with the others, since people will take the action you ask them to take. I.e., if you ask people to comment, they’ll Comment. If you ask them to share, they’ll Share. So if one of those numbers is waaaay higher than the usual ratio, particularly if it’s the Share that’s over-performing (Sharing is the usual ask), someone likely promoted the post via a non-Facebook channel. In any case, always look for the ways different tools can reinforce each other’s strengths and cover their weaknesses. Step 1: Have each member of the sales team create a LinkedIn and Twitter profile. This includes having a professionally done photograph. Ensure that every rep’s profile is 100% completed. Marketing should give some guidelines on language used. Step 2: Connect with everyone in your company. This will allow each rep access to the rest of the organization’s network and increase the number of 2nd and 3rd degree connections. Having these are crucial not only for network growth but also getting referred or introduced through trusted sources in your company. • 5 specific groups for your field. Step 4: Ask your past and current colleagues, customers, or vendors to recommend you. You’d be surprised at the importance a short recommendation can hold. Potential partners or prospects are likely to check out your profile when considering doing business with you. Step 5: Interact once at least once a day through your activity stream. Most of your home page is taken up with updates from your connections. There are several ways you can interact with these updates, depending on the type. • Send a message — When your connections make new connections or take several actions on LinkedIn, this information shows up in your activity feed. You can send your connection a message. • Favorite — Posts from other social media sites often enable you to favorite the posts. For Twitter posts, you can retweet or reply as well. • Like — Changes in status and other actions enable you to Like the post. This is an especially good idea when your connection has a job status change; it’s a good excuse to reconnect. • Comment — Many types of statuses enable you to comment. Your connection sees the comment as well as anyone following either of you, so make your comment pungent. To turn any ideas into reality you've got to stay on track and make the best use of limited time, especially if you are an entrepreneur or small business owner, your responsibility get double. But thanks to mobile applications that make our lives more productive and convenient than ever before. So without further ado here I've collected 21 best iPad apps every entrepreneur should use to stay organized, connected and entertained. Evernote - Create notes with text photos and voice recordings and share them with anyone. GoToMeeting - A web conferencing and online meetings app that allows you to share your presentation and screen. Office2hd - Open, create, view and edit office documents. Google Drive - Access all the documents in one place. Yelp - Easily search for restaurants, bars and shopping centers. Keynote - Create wonderful presentations and add media, a variety of tablets, 2D and 3D charts and more. Bloomberg - Be update with the world economy. CNBC - Get important information about stocks, indices, news and much more. Accuweather - Know the weather conditions for any place in the world. Flightboard - Keep track of all the arrivals and departures of flights all over the world. Skype - Call people all around the world with voice calls, video calls or send instant messages. Lunchbox - See all the restaurants, shopping centers, bars, nightclubs near your area. Catch notes - Is a great app that allows entrepreneurs to capture their innovative creations so they never miss anything like text, voice or notes either online or offline. Bento - Create anything from recipes inventory and different lists, organize contacts and clients and more. Tripit - Plan your trips in full detail on your iPad. StumbleUpon - Enables you to discover amazing stuff from the internet it shows only personalized interests that you like. Jasmine - Is a is a good and free YouTube app alternative, along with the video it enables you to play audio in the background as well. Mention - Is a social media application that tracks and alerts when someone mention you or your brand name. Remember the Milk - A great app that allows you to access your to-do work-list from anywhere in the world, never miss an event, get reminders in the form of emails and text. Dragon Dictation - A voice recognition app that enables you to give commands to your iPad and control it with your voice. Twitter is an absolute powerhouse. And while it is one of those networks that you either love or hate, my job today is to try to convince you to start loving it! Not only is Twitter a great tool to communicate with your clients, answer support questions, and engage in different conversations happening over the social web, it is also a great network to meet and prospect new clients and leads. 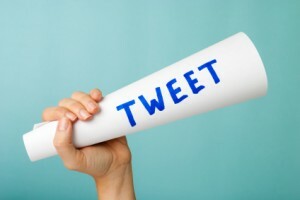 Every small, medium, and large business should have a Twitter marketing strategy. 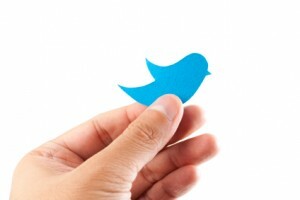 You can capture leads on Twitter with Twitter cards. Twitter is 7 years old. 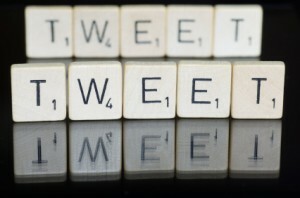 There are over 500 million Twitter Users. Your handle length is important as if people retweet it will eat into their character limit. If your first character of your tweet is an @ you should put a "." in front so it shows up on your feed. Convert With Content is on Twitter. Twitter is the best network to listen on because most accounts are public. Twitter is a ton of fun! 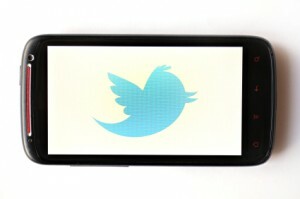 You should have an active Twitter presence.